Almost like a death in the family, I am faced with the loss of my favorite vendor: Blanc d'Ivoire. Recently this French furniture company decided to close their NY office, thus making it nearly impossible for small independents like myself to order their merchandise. They now require you to buy a container and that's unrealistic for a designer with my sized business. So, I am now forced to buy their product wherever I can find it and just hope that I can find it. I know Indulge in Houston recently bought a container full so I'm anxious to see what pieces they ordered. But still, this is a loss that I am taking hard! My favorite client and I perused their web site so much we only referred to it as BDI in email exchanges. 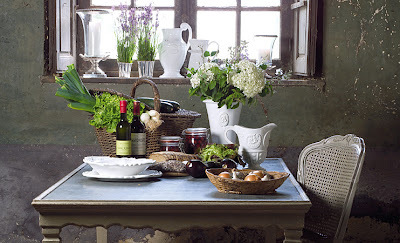 Their merchandise is everything I love: white, crusty and grey patinas, french and Swedish inspired designs, and cheap. Did I say cheap? OMG, you can't imagine! It kills me to think I'll be paying retail for it now, but even at retail prices, it's still a bargain. And so, here is my final ode to Blanc d'ivoire - thanks! It was a blast while it lasted. Not only do they sell furniture, there are wonderful plates and vases all in the creamy and white tones BDI is famous for. 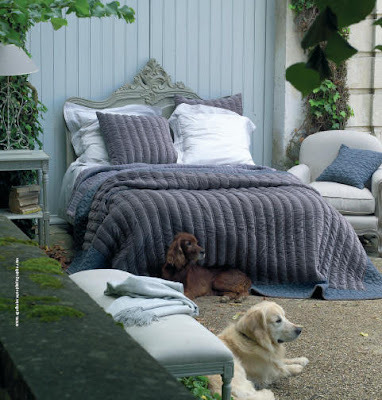 They also make wonderful French quilts and bedding. I love their mirrors and light fixtures, along with wonderful consoles and buffets. This is a dining table from their new line of furniture. 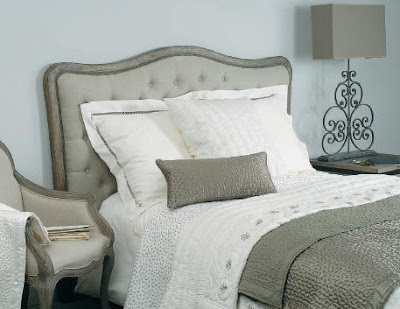 This traditional headboard comes in different fabrics and colors. 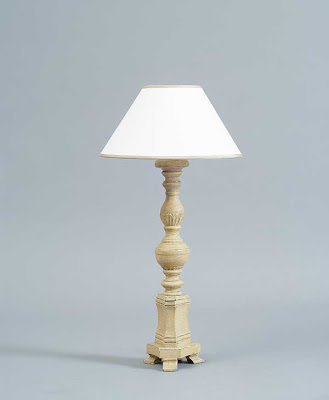 They also have a large range of lamps and chandeliers. 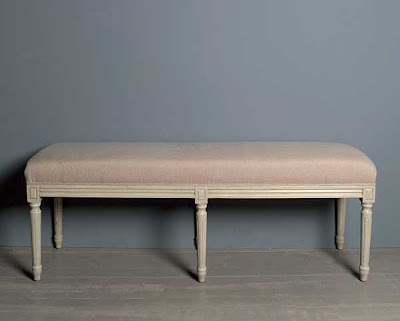 I might have ordered this bench from BDI more than any other independent designer in the U.S. A meal for two at a restaurant probably costs more. No, wait - maybe this lamp is my most oft purchased item from BDI. 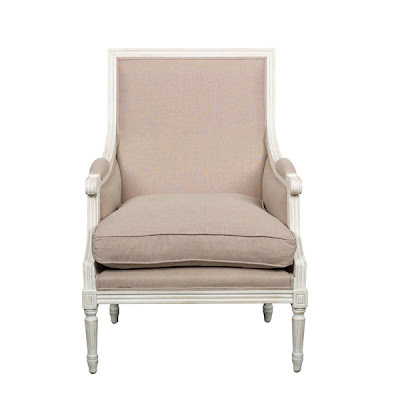 This chair is so wonderful (and cheap) that I ordered almost the entire inventory left in NYC, "just in case." So, now I'm thinking, with the demise of my almost free ride with Blanc d'Ivoire, what will take its place? What do I buy from other companies that are great bargains? What other good deals are out there for cheap? What catalogues do I go to time and time again to "fill in" when the big boys fall short? 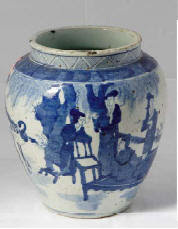 Global Views: A wonderful to-the-trade catalogue. Mostly I buy tables from them. They are inexpensive in price but don't look it. 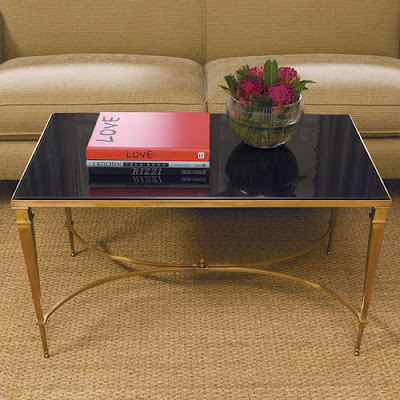 This table has a black marble top and brushed brass legs. It's stunning in person, especially for the price. This is another wonderful table from Global Views. 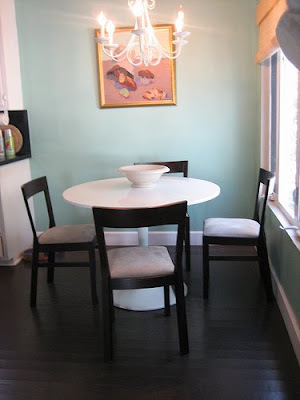 It's perfect for drinks next to a club chair. 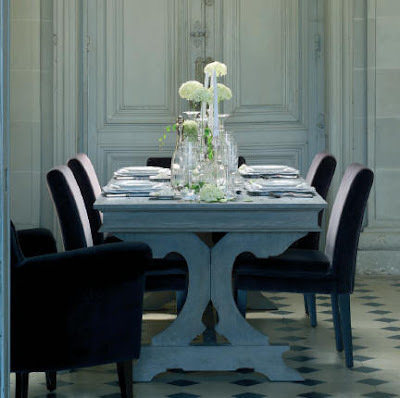 Their tables come with antiqued mirror tops, glass tops, and white and black marble tops. They also come in silver or brass. 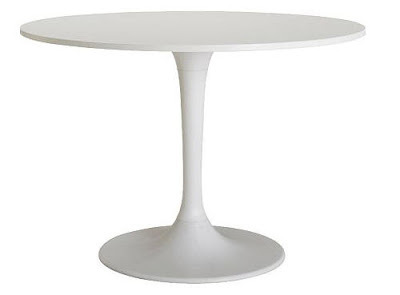 There are square tables, round ones, and oval ones. I spot Global Views tables in all the shelter magazines, in surprisingly pricey homes. I noticed that Ivanka Trump has some in her stunning apartment. I never fail to smile when I spot one in a million dollar home. 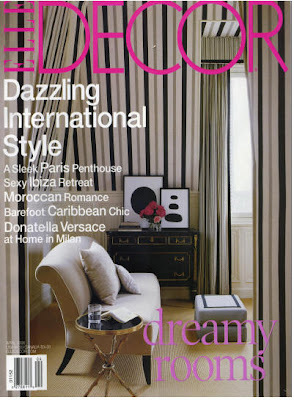 Here on the cover of Elle Decor is one of my favorite Global Views tables. 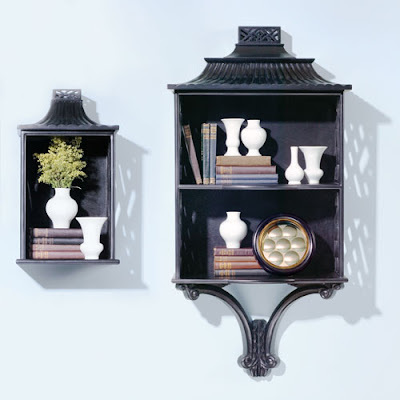 I love these wooden pagoda shelves from Global Views. Their array of products is immense. Most stores that sell accessories will invariably stock some items from this powerhouse company. Another favorite catalogue is Wisteria. 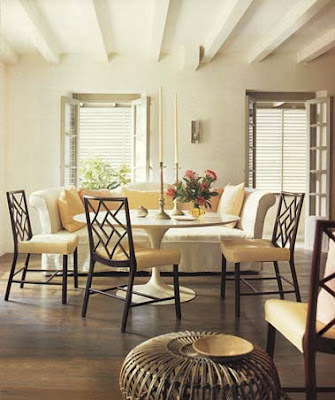 Started by the young daughter of famed Houston interior designer Jane Moore along with her husband, this catalogue has taken the design world by a storm. In the beginning, it was stocked with an array of goods gathered from around the world. Lately the catalogue seems to be going in a new direction. Painted reproduction furniture has taken over from the exotic. Apparently, it's been a very profitable move. 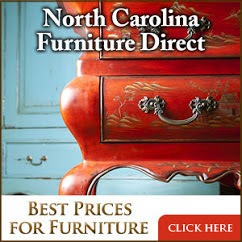 Most, if not all of the painted furniture is backordered for months. 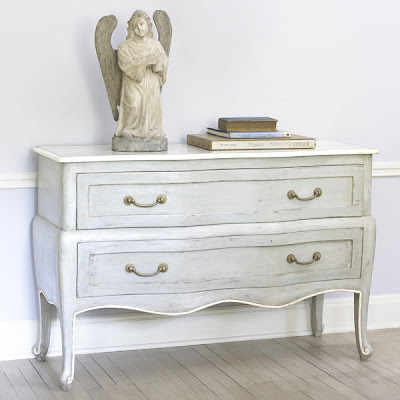 Above, is one of their more popular pieces from their painted furniture line. This garden seat from Wisteria is a personal favorite. I can't count the number of times I've ordered it. It's beautifiul with its slightly muted, antiqued tones. I own three of them myself. Primarily know for their richly embroidered fabrics, Chelsea Editions has a line of furniture inspired mostly from Swedish antiques. This company will probalby be my replacement for Blanc d'Ivoire. Their furniture is actually of a much finer qualilty than BDI and the prices, though somewhat higher, are still very reasonable. 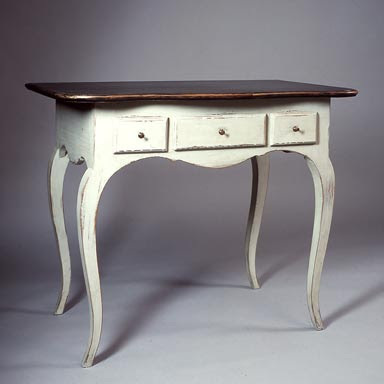 This table above is a versatle piece, perfect as a nightstand, a small desk, or a tea table. Unfortunately, Chelsea Editions is a to-the-trade only company. When I have a client who isn't interested in paying Conrad or Hunter Douglas prices, I send them to Target to buy these tortoise shell blinds. I've used these dirt cheap blinds in the most expensive of houses. Highly effective, Target blinds are one item you can substitute with for times when the budget gets tight. west elm is Pottery Barn's contemporary answer for the hip, young, urban crowd. When designing for a teenager, I love to use their platform beds with their wooden headboards - which come in several different styles. Besides teenagers, west elm appeals to singles and the newly married. Very good quality for the money. 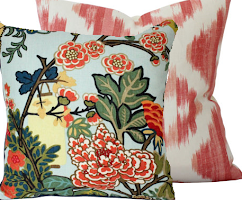 If west elm is too severe for your tastes, a new contender, Brocade Home may be the answer. Frilly, damasky, and ultra feminine, young women are going crazy over this new catalogue. 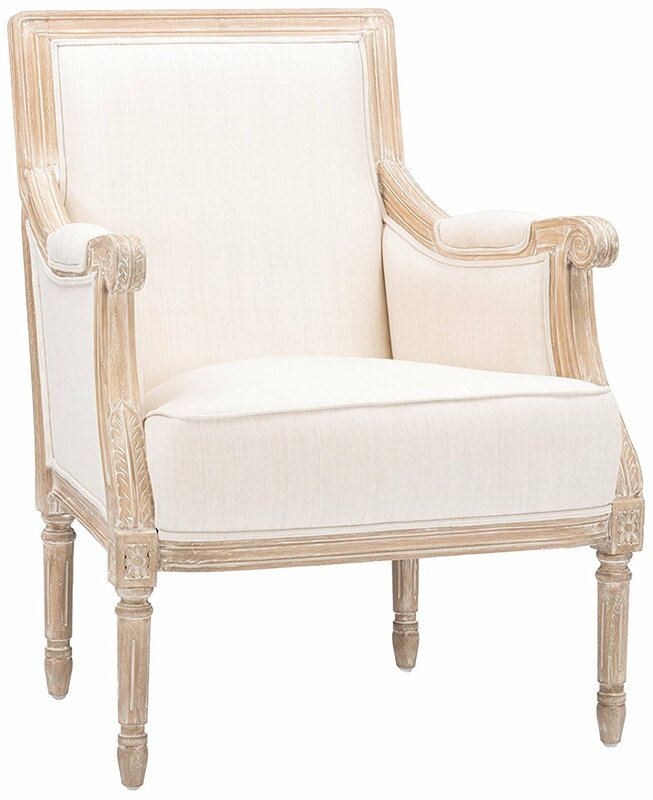 My favorite pieces are their chairs: french inspired, with light painted finishes, these chairs could go from a vanity to the dining table for the right client. 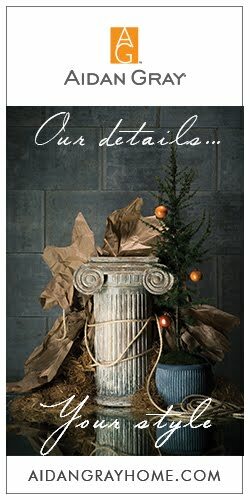 Pottery Barn, the old standby, recently updated it's line. 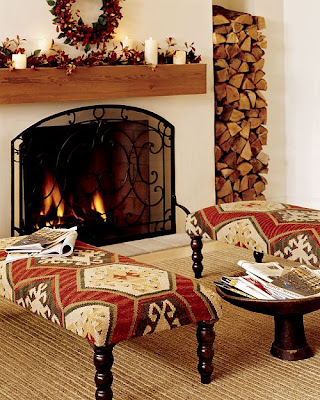 These pieces are a standout: the kilim covered bench is fabulous and would add texture and atmosphere to almost any family room or library. Great look, great price. 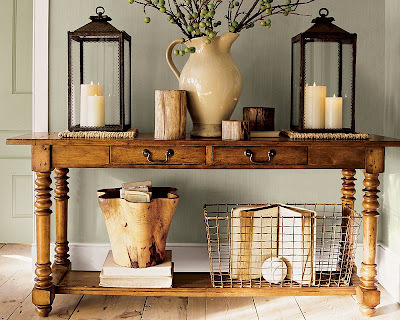 I love this new Pottery Barn console. I think it's great looking and I am planning to use it in a room I am currently working on. This rush seat bench is from the same group as the console, above. 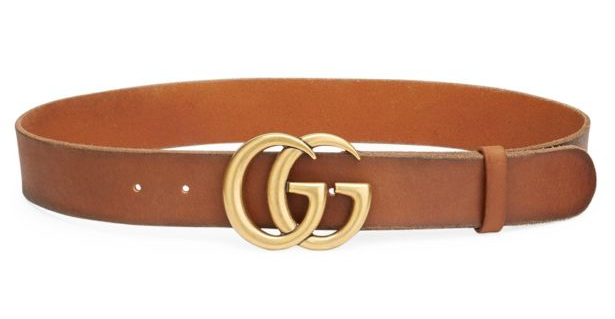 Again, great price, great look for the money. 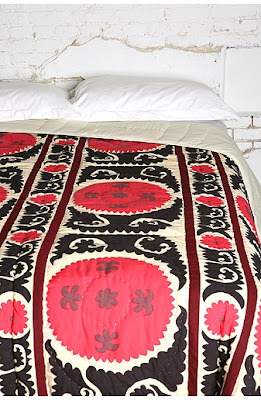 Online from Urban Outfitters: this is a quilt wiht a suzani pattern. It makes a great bedspread or a tablecloth for those who want a suzani but don't want to pay the high price for a "real" one. This is suprisingly good looking and effective in person. 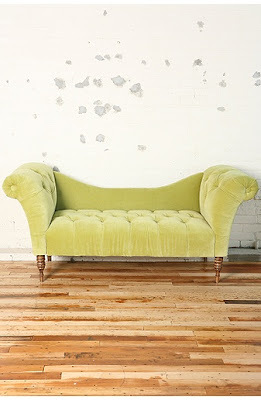 For young clients, I love this velvet bench from Urban Outfitters online. I've used it in a teen's bedroom. Target carries this same piece on their web site. 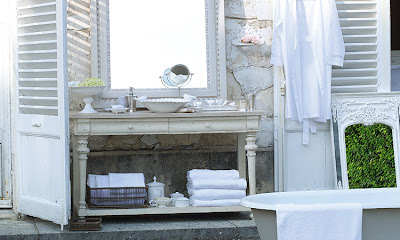 Ballard Designs has long been known for their trendy items, many of which have a french provenance. Before it was sold and was still ultra unique, practically everything in the catalogue came in chartreuse. Today, they have a much larger color range. 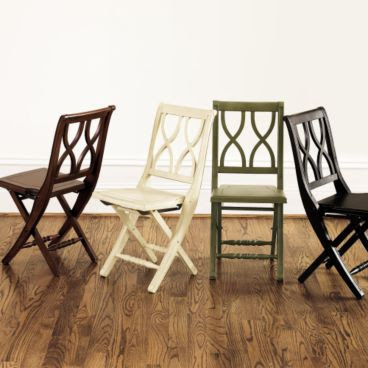 The items I buy over and over from Ballard are these chairs. Fold ups, they make great extras for dinner parties, offices, breakfast tables, and even a dining table until "real" chairs are affordable. 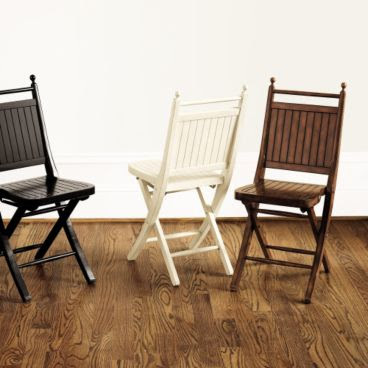 Originally, they only came in tortoiseshell bamboo, now the chairs come in many different patterns and colors: here they are in white cane. And again, with a great new cut-out design. Zebra rugs and anything zebra striped is this years coral: Major Trend Alert. I found this company, Pacific Artifacts at Round Top. Call them to buy one of their great rugs. I did! And I'm sure I'll be buying many more in the future. 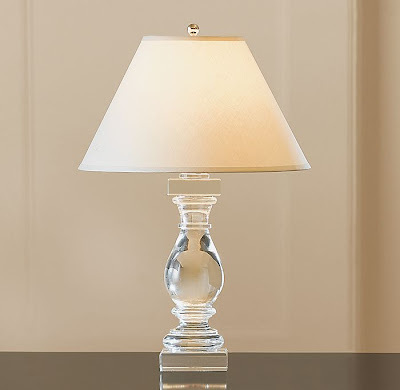 Restoration Hardware makes this clear baluster lamp. It's heavy, well made, beautiful and currently on sale. I use this lamp over and over again. It's my favorite right now and it goes well with almost every kind of decor. 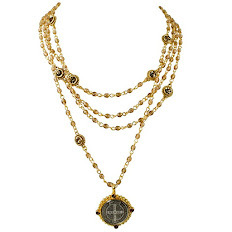 Oly Studio is another favorite to-the-trade only online source. This bench is hot right now and has been featured in a lot of magazines. Oly makes furniture for hip people who like trendy things. 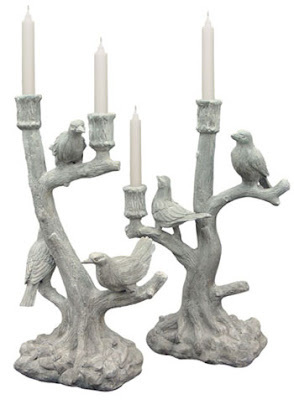 Here are my favorite accessories from Oly Studio: faux bois bird candlesticks. Did I say Oly specializes in Major Trend Alert products? 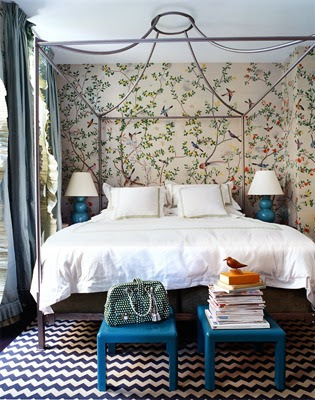 Here we kill two trends at once: birds AND faux bois. I love when that happens. Another item at Ikea that I love is their line of slipcovered sofas. 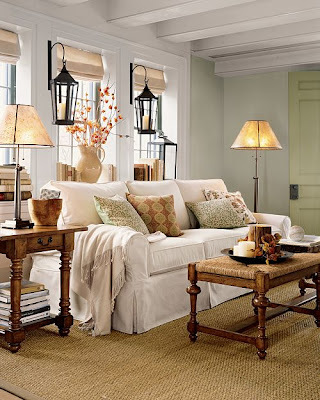 Pieces in the line include a sofa, sectional, chaise, ottoman, and chair. 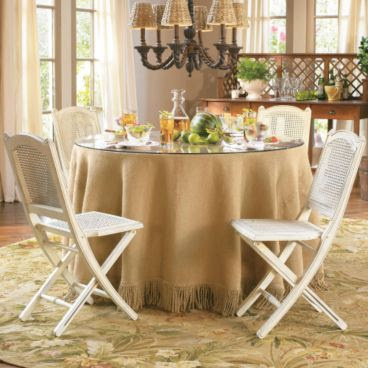 The slipcovers come in many different fabrics, but the white is my favorite, of course! It's very comfortable seating, especially for it's dirt cheap price. I've sat in sofas that cost 10 times more that weren't nearly as comfortable. Great for a beachhouse or a playroom. 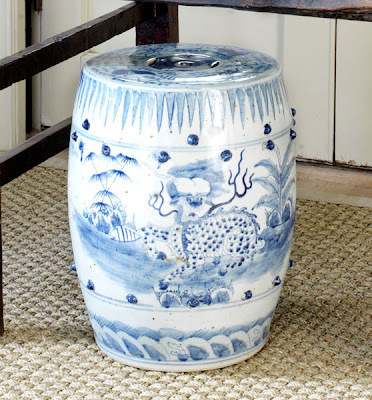 Legend of Asia has tons of blue and white pottery and just about anything else you could want from, well, Asia I guess. They have garden seats in every color, porcelains, pottery, accessories, and furniture that's new and antique (supposedly). Besides the blue and white, in case anyone cares about any other color, there's green, celadon, white, red, and orange. Best of all: trade prices! Great customer services make them an easy company to do business with. These bird prints are popping up everywhere. Again, a room by Tom Scheerer. Here the bird prints, by a Swedish artist, are original. Everytime I turn around, I see another designer using these prints. 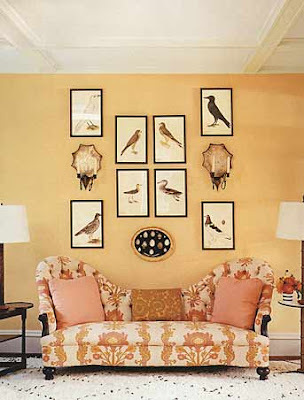 Recently, I spied them in Bunny Williams' beach home, shown in her new book. If you can't afford the originals, Anthropology has the complete set, one is pictured below: I've not used them yet, but I'd love to find a client who is game. 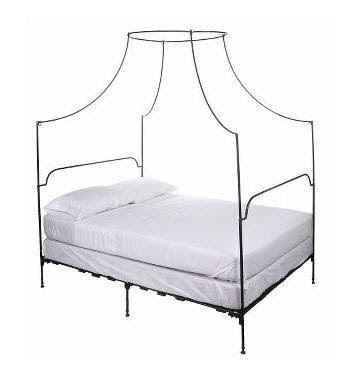 Here, acclaimed designer Miles Redd uses a more upscale (expensive) model of the same bed. Redd apparently loves this bed, he's used it quite a few times. 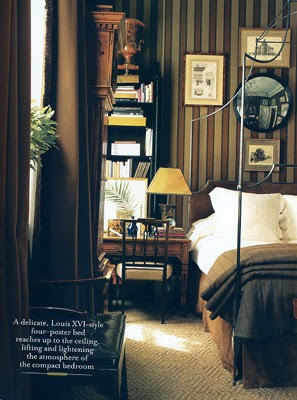 Here, Redd, again uses the "Anthropology" bed with a more masculine feel. And lastly, the English catalogue OKA Direct has great, inexpensive finds. 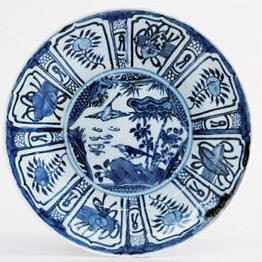 The designer Michael Smith has been quoted as saying he buys all his dinner plates from OKA. He especially loves the above blue and white dinner set. I do too. One day, I plan to buy the set for my everyday dishes. 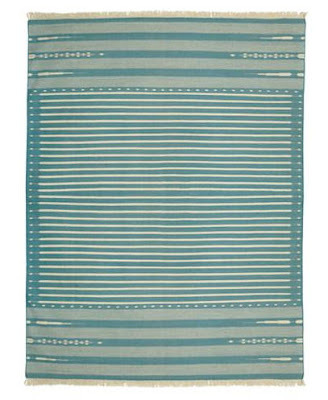 Besides dinnerware, OKA sells furniture, some of the painted variety, drapes, cushions (pillows to us Americans), accessories and rugs. I love this blue and white striped dhurri. 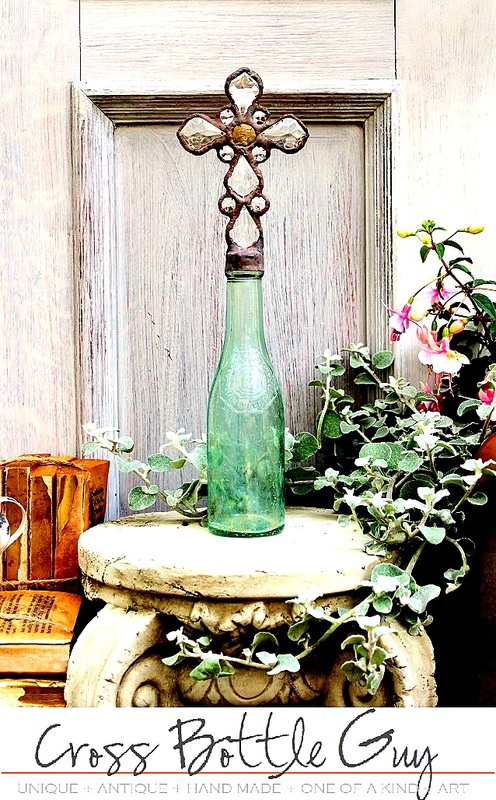 A great item to use if you want a "Somethings Gotta Give" feel to a house. I bought two of these vases from OKA. They are huge!!!! So huge that they overscaled everything in my house and I finally just put them on the floor on either side of a french door. Dealing with an English company may seem daunting to Americans, but OKA made it simple. A few weeks after I placed the order online, they arrived, well packed, and in one piece. Have you ever bought any of my favorite catalogue picks? What are your favorites? Have you ever had a bad experience dealing with a catalogue or an online company? I'd love to hear about your favorite (or not so favorite) purchases. And, to those who made it all the way to the end of this post, as a reward for your endurance, if you want to buy something from the to-the-trade companies, email me and I will be happy to help you with the order. Well Joni what a wonderful post. I am going to have to take my time and digest all your wonderful finds. Great resourcing!!! As a professioanl designer with a business can you not speak to Induldge about getting 20% discount? At least you wouldn't be paying retail. The other idea is to start your own importing company, source great pieces you love and stuff all the profits in your own pockets. You've got such a great eye and excellent contacts (and fantastic blogging designer pals like Patricia) - couldn't you join forces? Thanks for all the info. Only one problem. What is the web address for Global Trading? Your link doesn't lead to the right place. Again, I enjoy your blog every time! ok - MARY: I made a huge mistake!!!!! It's not Global Trading - I've been watching too much MSNBC news I guess - it's Global VIEWS!!! Thanks for pointing that out to me, what an idiot. And to Liberty: yes, I do get a discount, but I'll be leaving an additional 30% on the table and that's a large amount espcially when the budget is small or teeny tiny. I probably could get someone to order with me, but I just don't know anyone, except for one person, perhaps. It's ok, like I said - Indulge will be carrying it, but it's just not the same and I'm so upset about that!!!! It was a great resource for so many of my clients. 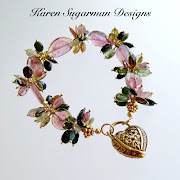 I have been reading your blog for a few months now, love it! We have the same taste and I have MANY of the exact items you listed!! 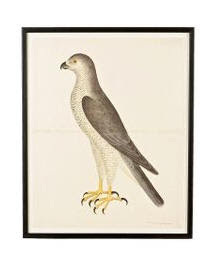 I LOVE the bird prints but cannot find them at Anthropolgie.com. Any suggestions? Worlds Away: http://www.worlds-away.com/ - very inexpensive, but look great. Wonderful coffee and side tables, amazing mirrored lamps. Lots of interesting mirrored products, like the mirrored trashcan. Great casegoods too. To the trade, but they sell at a lot of retail stores. You see these products all the time in the shelter magazines. Great accessories, lighting, and furniture. You also see these products in the magazines all of the time. The wholesale price is fantastic, and these products look great. There are some great items in their collection, particularly side tables and mirrors. 1. 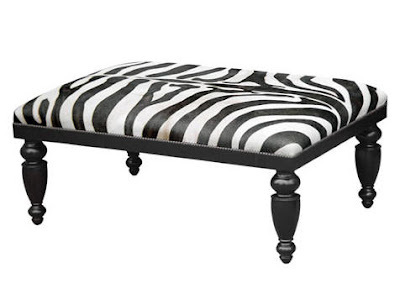 I have a client who wants a very specific ottoman made out of a zebra hide. How much should she expect to pay per hide - i'm not sure what a "good deal" is? 2. Would you ever consider leading a group to Round Top next year? It looked amazing . . . and overwhelming. I loved all the stops you made and would want to retrace your steps. 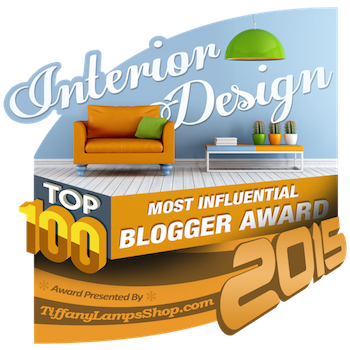 Thanks again for all the great blogging! Joni... you rock! What an amazing array of resources. I can't wait to spend some time looking. Great info Joni! Wasn't familiar with BDI, but I'm sorry I'm late to the game. 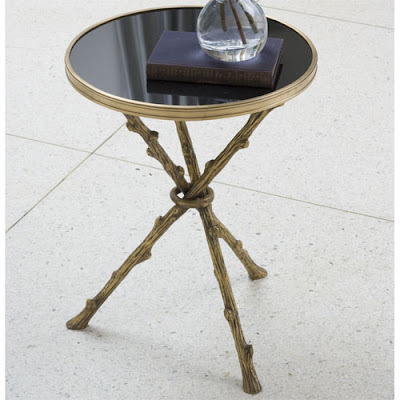 I LOVE my Global Views Twig table- just adore it. 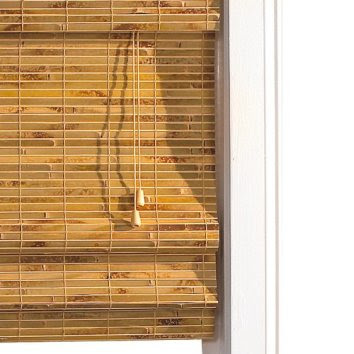 I too have bought the bamboo blinds from Tarjay- they're great, but I wish they were lined. Will check out the others you mentioned ASAP. What a fabulous post. It feels like Christmas. It's so great to have some inexpensive resources for clients. Thnak you!! The BDI headboards were great looking pieces. I love reading your blog. You have such great posts each time. I think I may need that little twig table. HI everyone, thanks so much for all your comments! I appreciate you taking the time to leave them. Renee: I bought my hide, new from the source I mentioned in my post for around $1100. I think that is really cheap. I've seen them for around for twice that! As for leading a group to Round Top, Im afraid I don't have the stamina, but I do know there are groups that come in buses!!! whew! what a great lot of info. 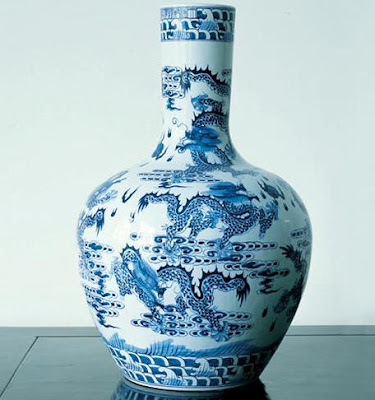 i can't wait to check out the asian pots. I had hard time with Blanc d'Ivoire actually and even if I am in France and it was my taste I had to change to others companies .. So I'm sure you will find others that you will really like..
Great post! I'm sorry to hear you're losing a favorite source and it looks like a terrific one. Thanks for sharing so much good info. I especially like the blinds from Target and the blue and white vases from OKA. oh my god. so much great info. thank you. i've bookmarked a bunch of these. Really fantastic post--so full of great resources! I loved taking my time to read through them all and now I'm off to check out the links . . .
Really fantastic post and so full of great resources! Loved reading through them all, and now I'm off to check out the links . . .
what an amazing post. Joni. The time you've spent is incredible - but even more so this is tremendously helpful. I am crushed when a go-to resource goes away or changes their focus. So it is essential to maintain backup sources. Excellent resourcing. than you for sharing! Such a helpful post Joni! Your are truly amazing! There was a Houston home with Swedish design...I think it was a friend of yours?...and some of the reproduction items were from Country Swedish. what a treasure trove of wonderful things all in one post. thank you for all the eye candy! i'm sorry to hear your fave frenchy shop is changing their ways. i'll try to pull together some ideas to add to your replacement list this evening. Oh my goodness, apologies for the triple comments--I had an error message when I hit 'publish', and then there were three . . .
Great info! Thanks for posting BB8's kitchen table too. I remember seeing that post awhile back, but could not remember where or which co. made the good knock off. I am seriously ready to get one and a zebra rug asap! This is such an informative post. Thank you for the good suggestions. Wonderful post, so much inspiration!! I am shocked and saddened to see your purchase of a zebra hide. I feel compelled to make a response. I came upon your site as I was conducting some research of my own on the Internet. Obviously you are unaware that the zebra is a threatened species. Certain persons in the trading industry would like you to believe that the zebra population is healthy and adundant, but sadly that is not the case. Grevy's (Imperial) zebra is the largest of all the zebras and it is indeed an endangered species. It is the most sought after zebra in the design world because it is a very striking, tall zebra with narrow stripes which encircle the rump in a concave pattern. I know this as I live in Kenya, and I study the zebra (Hippotigris). Several years ago there was a significant increase in poaching, particularly in northern Kenya, as there was a great demand for the narrow-striped skin of the Grevy's zebra for the manufacture of rugs and other products. This resulted in the sharp and sudden decline of the species. Since Kenya banned all hunting, and the export of zebra skin products, the poaching has declined somewhat, but numbers have not yet recovered sufficiently for the Grevy's zebra to be removed from the official list of endangered species. Many species of zebra are now extinct because of hunting practices. It is illegal, not to mention horribly cruel, to purchase zebra skins (which are obviously poached). By advertising the purchase of a zebra product, you are supporting the animal parts poaching trade which results in thousands of indigenous zebras being butchered for their beautiful stripes, their skinned bodies left to rot in the scorching African sun. 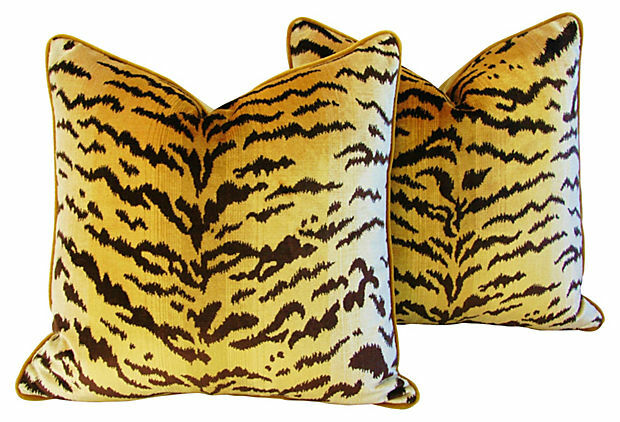 There are so many faux and cruelty-free options available in interior design (and I don't mean printed cowhide as that too is animal derived) that there is no excuse to support illegal wildlife trade. Animal skins are best left on animals. I suggest you do your research before you display and glorify products on your website. As it turns out, the zebra is endangered because it is hunted and killed for the very skin you promote. Thanks for the information. 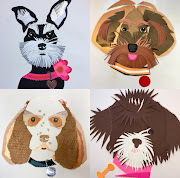 I won't be endorsing any of these animal atrocities in the art and design world. I prefer drawings. Your site has been reported to PETA. Wow! I can't wait - thanks for reporting me. What an honour. 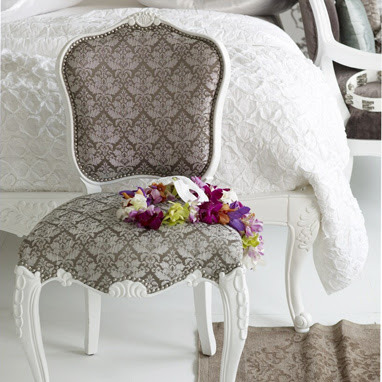 We are the suppliers of furniture items to blanc d'ivoire you have seen in their catalog. Really its beautiful.We are supplying them from last three years from india. 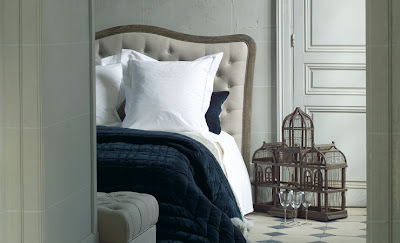 Ok, so those first few pictures of the merchandise of Blanc d'Ivoire and the White Euro Shams I'm SO Jealous of! Joni, I've looked EVERYWHERE for white pillow shams, and I'm just exhausted. I want them for the guest room, but I'm hesitant to order online because I want to feel the texture of the weave/thread count before purchasing. My guest will be here early October - so it's just do or die time - Euro shames should NEVER mean that much to a person. You got any ideas? Holy the zebra skin is scary!! My eyes, my eyes!! !